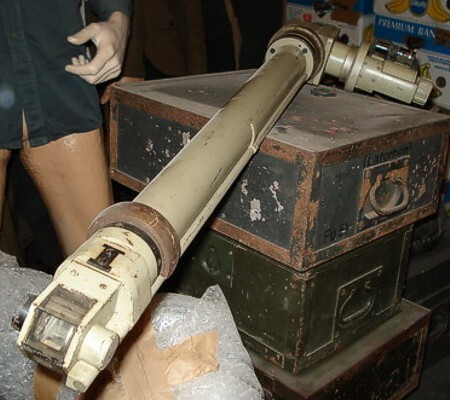 This device was used for general observation behind an armoured plate or inside a cupola. Some observation cupolas had them installed as side optics, but the MG gunner in a cupola or behind a plate, also used them. 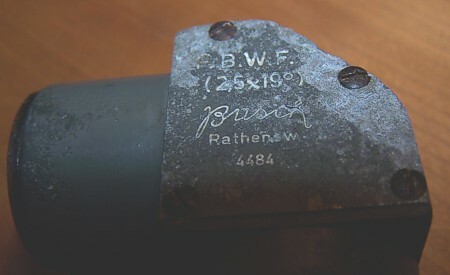 In the main section "related" we show the armoured parts that were needed to fix the P.W.B.F. 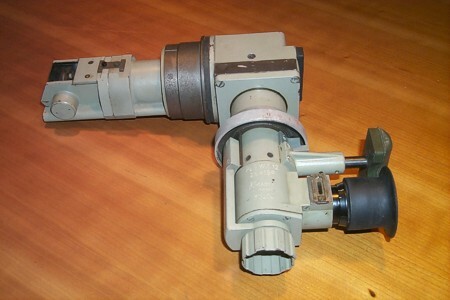 The Bunkermuseum in Zoutelande (Netherlands) has a fine collection optics and related items. This series has an optical performance of 2,5 x 19 degrees. All secimen have a prism in the head, that could rotate 180 degrees horizontally. They have reticules which could be illuminated. The headrest prevents inside light going out when there was no head before the lens. 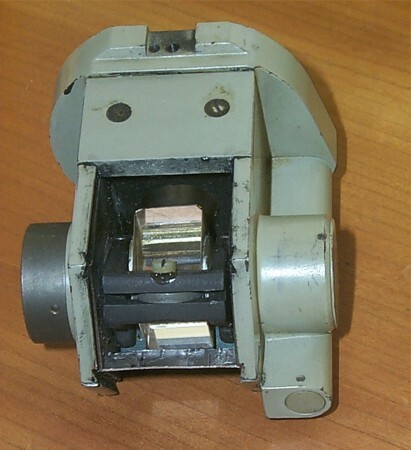 Note that nr 12 has only one bearing. We found documents that also mention a 10 and 13 in this series. This is the shortest version, the "12". The nine. 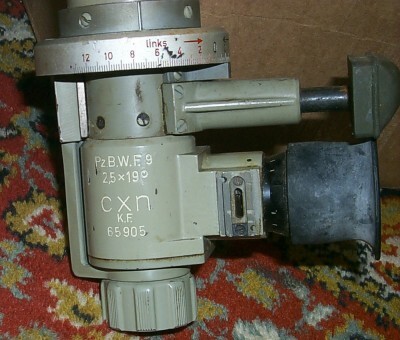 You see the headrest, the connector for the illumination cable and the knob to rotate the headprism, which lies right. This head mises the 4 glasses which protect the optic from weather and gas. They were replaced. 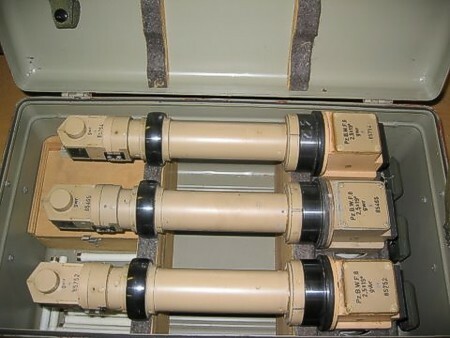 These optices were sometimes re-used after the war. The Norwegian army is known to be such an user. 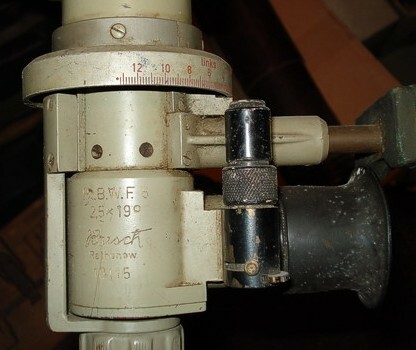 For some reason they always removed the knob for rotating the head prism, as shown on this "8". A box full of 8's in "Africacorps yellow". It proves once more that the colour has nothing to do with the location of equipment. The lower the number, the longer the periscope. Here a complete "7". After restoration fully operational. The longest version found so far is the "6". It is long, very long. It was used in very thick cupolas, such as the 442P01. 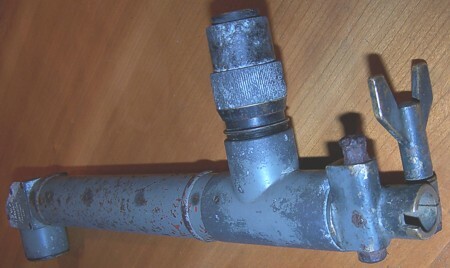 A small periscope was made for the "Kleinstglocken" 89P9 and 90P9.